UPDATE: We’ve pushed back my comic course’s next start date until Sept. 9th! 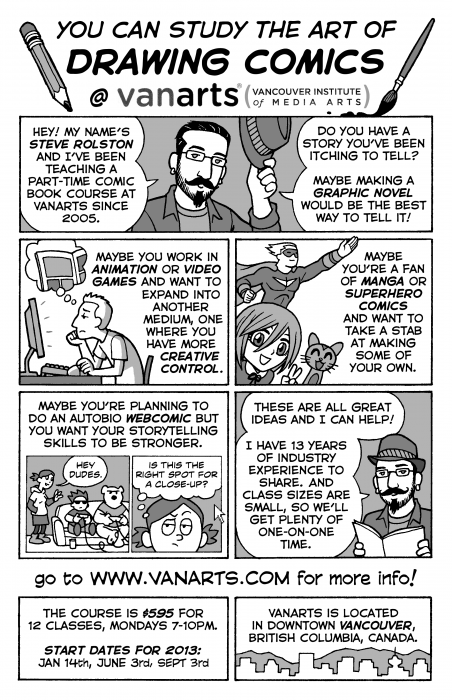 Earlier this week I wrapped up another comic course at VanArts. As usual, not everyone completely finished their four pages but I think they all walked away with a smile on their face and some knowledge in their noggin. I gotta say, it does feel good that many of my students express real gratitude for the things they’ve learned in my class. Most often it’s a variation of “I didn’t realize just how much thinking and hard work goes into making comics.” It’s true. Comics can be fun but it’s not always easy. My main goal with the course has always been to shed light on the process and possible storytelling hurdles so that the students don’t have to learn everything through their own slow trial-and-error. If you want to be part of the next group, the time to sign up is now! My next Introduction to Comic Book Production course is scheduled to start up on Sept 3rd at the Vancouver Institute of Media Arts (VanArts). It’s a 12-week course that runs on Monday nights (or Tuesday if there’s a holiday). I take my students through the process of writing, thumbnailing, penciling, inking and lettering a four-page comic. There’s a strong emphasis on clear storytelling, in addition to teaching all the other things I’ve learned during my thirteen years as a comic book artist. If you’ve already started working on a comic and would like some feedback, the Cloudscape Comic Society will be holding a Comic Clinic this Sunday, Aug 25th. They’re calling it a space to work with other artists to improve your stories-in-progress. I’m planning to drop in myself to see what everyone is up to. Another event you should check out if you’re a comic artist in Vancouver is the Process Colour exhibit that’s up right now at the Hot Art Wet City gallery. It’s “an exhibition of local independent comic creators and their [artistic/production] processes, demonstrating a variety of approaches to taking a story from initial concept to finished artwork. Features Tony Cliff, Rebecca Dart, Simon Roy, and Brandon Graham.” These are all brilliant creators and it’s a great opportunity to see how different artists attack the comic page. The show runs until Aug 30th.